Be informed- knowing the taxes and surcharges to expect on your "free" ticket. It’s fairly easy to find out how many miles you need for a particular redemption ticket- just refer to the award chart. Taxes and surcharges, however, are a bit trickier to price. You could do a dummy award booking to see the taxes and surcharges, but the KrisFlyer website is buggy, error prone and above all, slow. Besides, there will be times when you may want to book a partner award or a routing that the KrisFlyer website can’t support (e.g. mixed cabin, or using the stopover trick). The ITA Matrix was not built with award searching in mind, but it’s still a travel hacker’s best friend as it allows you to check the applicable taxes and surcharges that will be levied on an award ticket. On the next screen, you’ll be shown a list of airlines to choose from. In this case we’re looking at the taxes on a Singapore airlines award ticket, so click on that. That will cause the display below to filter out only Singapore Airlines operated flights. Click on the S$995 button, and you’ll be brought to the final screen where the cost is broken down. Everything that isn’t “Fare” is a tax or surcharge. The figures in the red box add up to S$169.30, which exactly matches the the SQ site for a similar round trip economy award booking to SYD. The ITA Matrix is equally useful for checking the surcharges on partner award tickets. 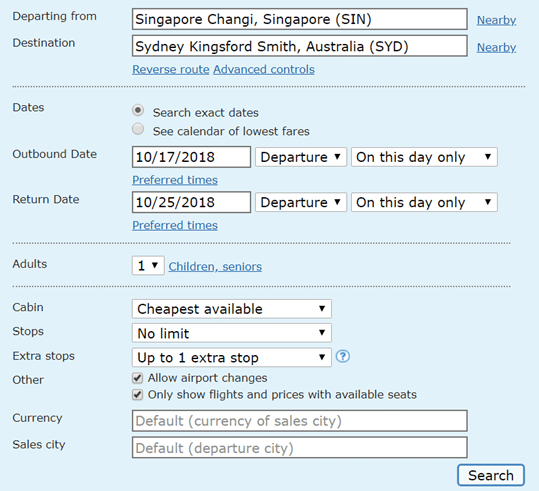 As you know, Singapore Airlines no longer imposes fuel surcharges on either award or revenue tickets on its own metal, but will pass them on if partners charge them. Let’s try looking for Singapore to Taipei on EVA Air. We follow the exact same process as before, but this time round we’ll click on the EVA Air option instead. 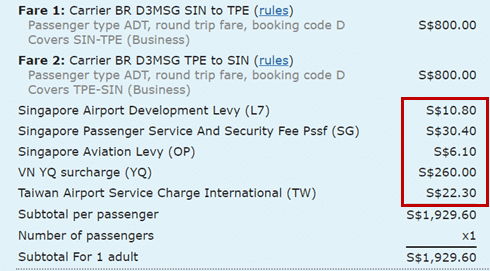 And there you have it- a total of S$329.60 in taxes and surcharges. 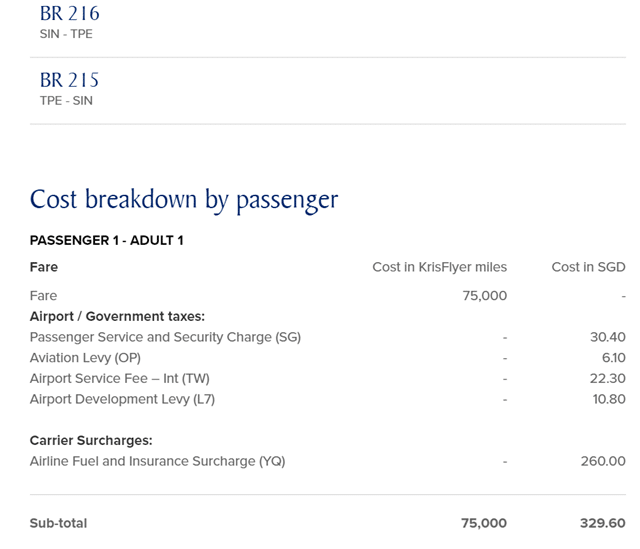 Note the presence of the S$260 YQ, which (along with YR) is shorthand for fuel surcharges (or carrier-imposed surcharges in the case of YR). These really are junk fees, but they’re part and parcel of mileage redemptions. There is currently a bug in the ITA Matrix that causes it to show the wrong airline code for YQ. Note how in the screenshot above it’s showing VN (Vietnam Airlines) instead of BR (EVA Air). Not to worry, though, this doesn’t affect the numerical accuracy. 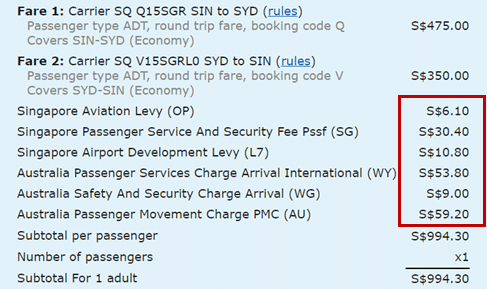 Looking for the same flight on the SQ website yields a taxes and surcharges figure of S$329.60. The ITA Matrix is certainly useful, but you should be aware that in some limited cases, the taxes on a revenue ticket may not always be the same as those on an award ticket. The figures in the red box add up to $134.30. $77.90 of taxes on an award ticket versus $134.30 for a revenue ticket. What’s causing the $56.40 difference? See what it says? Award tickets do not attract Passenger Facility Fees (S$6.20 in this case). 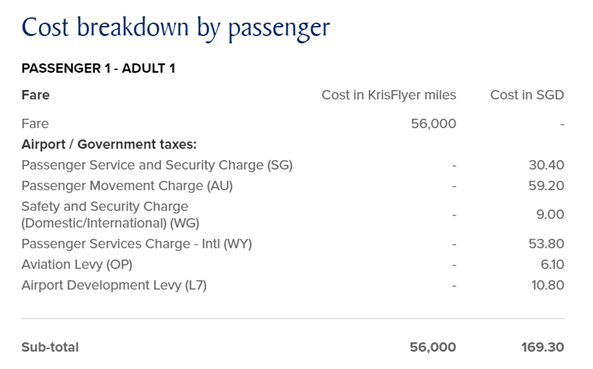 They also don’t attract the US International Arrivals/Departures Tax (S$25.10 each way, so $50.20 in this case), and that’s where our $56.40 differential comes from. Fortunately, such cases are the exception rather than the norm, and I wasn’t able to find any other country where such a distinction between award and revenue tickets was made (I checked the UK, France, Denmark, Italy, Turkey, Taiwan, Japan, Korea, Thailand, India, China, Australia and NZ). 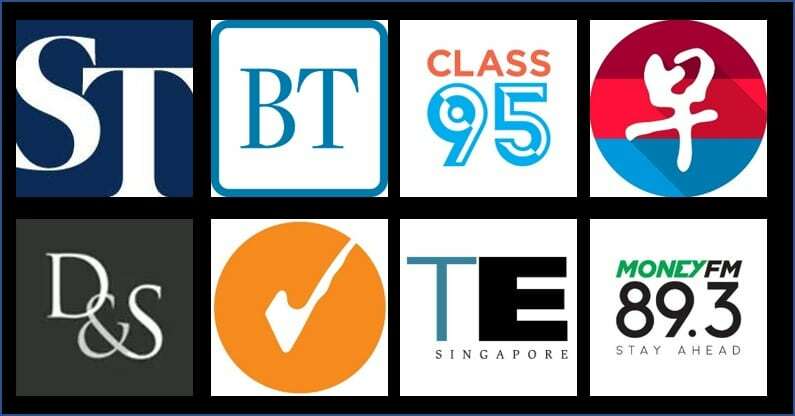 Therefore, with the exception of the USA, you can be quite certain that the taxes and surcharges on ITA Matrix will match those on your award quote. 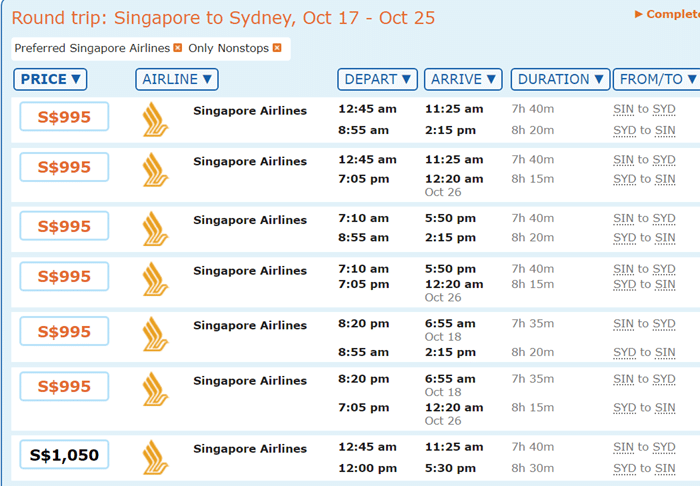 This happens because SQ288 flies SYD-CBR-SIN, and it’s that SYD-CBR leg which results in the additional S$23 of taxes. 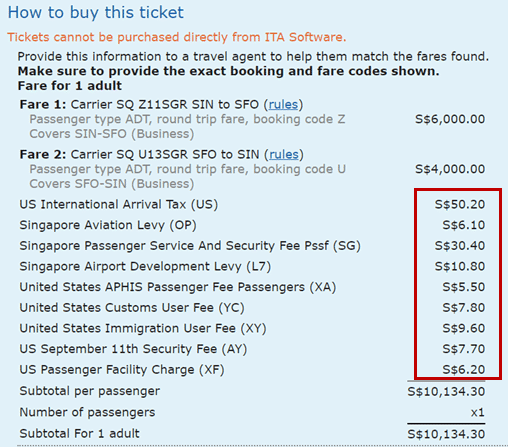 Along the same vein, SIN-SFO non-stop would be cheaper than SIN-HKG-SFO. Don’t assume that fees will be the same for all passengers on a particular flight, regardless of cabin. In the case of the UK and Hong Kong, higher fees apply for First/Business Class passengers. 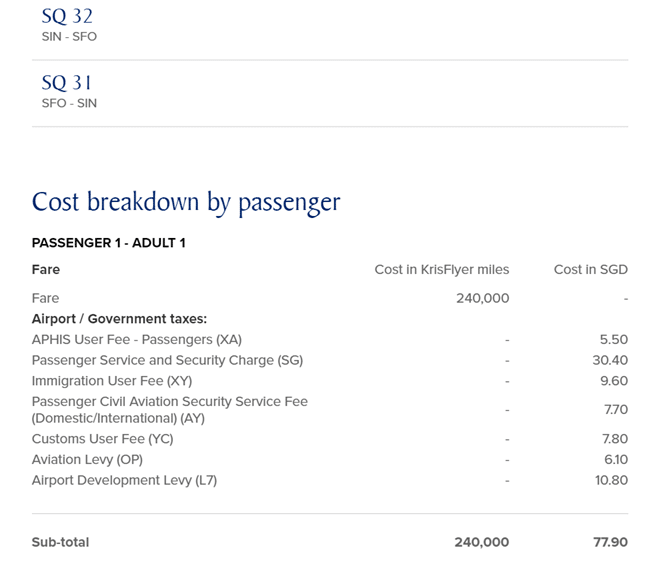 That said, if you’re comparing like-to-like, that is, a Business Class fare on the ITA matrix to a Business Class award on SQ’s site, your taxes and surcharges figure should still be correct. 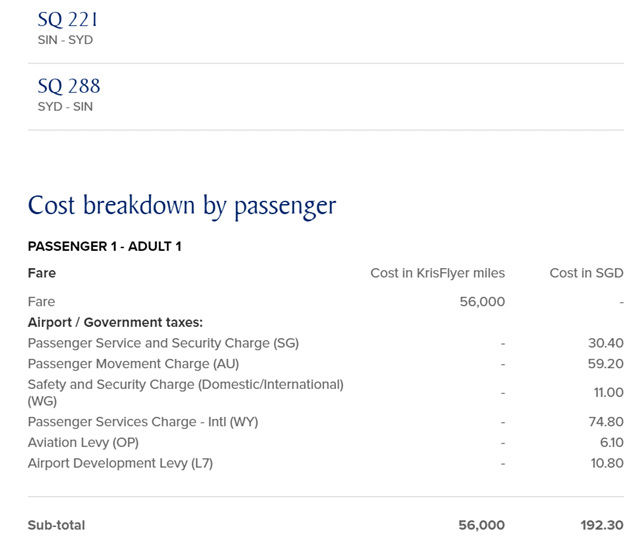 Qantas is a strange one- back in January 2015 they folded fuel surcharges into base fares for revenue tickets, but continued to impose them on award tickets. Therefore, the quotes that ITA Matrix throws up will understate the total taxes and surcharges. 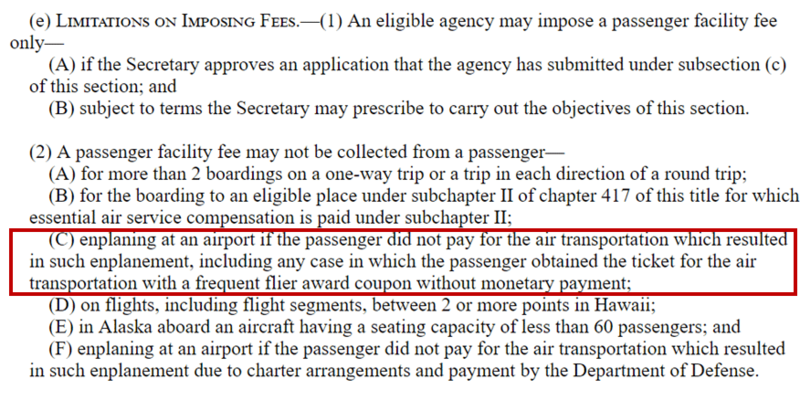 This only further re-emphasizes what a money grab fuel surcharges are. Many people don’t bother to question the taxes and surcharges they get quoted by agents over the phone. In most cases this isn’t a problem because those are automatically calculated. However, there are some airlines which still do this manually, creating the possibility of human error. In any case it pays to be informed and have an idea of what the taxes and fees should be before making a booking. Did you find this article useful? If so, come and join us for 6 October’s workshop of Advanced KrisFlyer and Power Award Searching where we’ll discuss tips like this and more! Interesting – thanks for sharing the link. Just so I’m clear – for any miles reward redemption (say in this case, its for SQ), I have to pay the taxes and surcharges separately (and there is no way that miles can be used to waive them off)? Sorry if this was answered before, are there any recommended cards (DBS Altitude, WWMC) for paying the tax and fuel surcharges for both offline phone redemption and online redemption on SQ website? Thanks. Could you give some examples of airlines that do this please? Kinda curious.